Dog Snoring - Is It A Probem For Your Dog? A dog snoring can sound quite cute; it looks (and sounds) as if your dog is totally relaxed and heavily asleep, enjoying a good rest! But if a dog is snoring, it is actually an indication that their breathing airway is partially obstructed, and it is NOT a healthy sign. 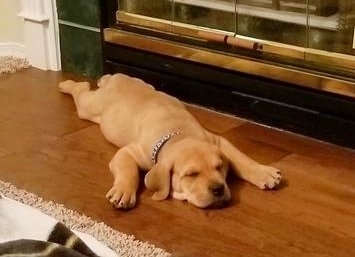 ZZZZZZZ . . . . . If your dog is snoring, it's the same as in humans; a partially obstructed airway means that they are struggling to get enough oxygen, resulting in poor sleep quality. Your dog is actually on the verge of suffocating! In humans, this can contribute to high blood pressure and an increased risk of heart problems. So if you love your dog, you'll want to try to reduce your dog from snoring as much as you can. But WHY does your dog snore, and WHAT can you do about it? Narrowed nasal passages. 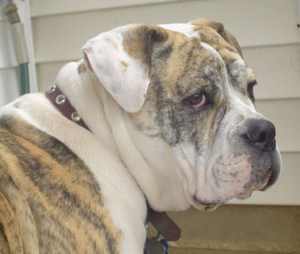 Some breeds of dog tend to snore more than others, due to the shape of their nose, such as bulldogs. The technical term is "brachycephalic". They have been bred over many years to have short, squat noses. Unfortunately this shape of nose severely restricts shape and size of the nasal passages, and these breeds are constantly struggling to breathe! Their nasal passages are already narrower than in other dog breeds. They are not good at prolonged exercise, as they tend to get puffed out more quickly. So, if any of the extra factors listed below crop up, these short-nosed breeds will suffer even more. Blocked nasal passages. This can be from the dog accidentally getting a foreign object (such as a small child's toy) stuck up their nose. Unless you can see the object clearly AND can a good grip on it, DO NOT ATTEMPT to remove the foreign object yourself. Get your dog to a vet as soon as possible. Trying to "have a go" yourself is more likely to force the foreign object even further into your dog's nose, causing even more discomfort for your pet. Infection in the nasal passages. Your dog can pick up a nose infection - similar to a human cold or 'flu. Sometimes it's called "kennel cough", if a dog has been in close contact with several other dogs for several days or longer. If you suspect that your dog has a a nose infection (or even a nasal discharge), get along to the vet quickly! Allergies. Dogs can suffer from allergic reactions in a similar way to humans, which can cause swelling in the nose and throat, leading to your dog snoring. Again, if your dog starts snoring for the first time, and seems to be having a problem breathing, take him or her to the vet sooner rather than later. Irritation from tobacco smoke. The chemicals in tobacco smoke (whether it be cigarettes, cigars, or a pipe) can irritate a dog's sensitive nose, leading to inflammation, swelling, and reduced airway capacity, causing snoring. The solution? Don't smoke in the same room as your dog! Excess flabby, loose tissue in the nose and throat, which obstructs the airflow and also "wobbles / vibrates" as your dog breathes when asleep, causing snoring. This is most likely to happen if your dog weighs more than it should do, ideally. To put it bluntly, if your dog is overweight, then it will have a higher risk of flabby tissues in the nose and throat. This means a higher risk of a reduced airway and snoring! This poor dog has been over-fed . . . 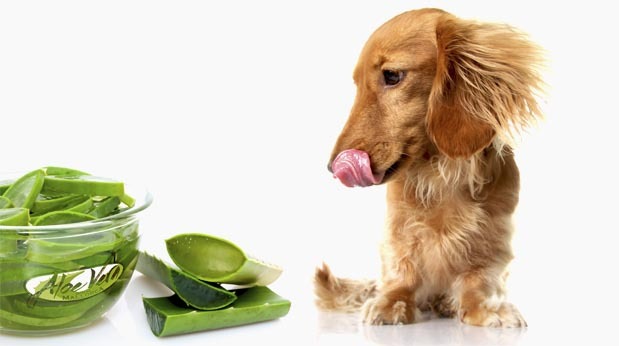 The simple solution here is to help your dog to lose a bit of weight! Sure, it's simple, BUT IT'S NOT EASY. We all love to treat our pets, and we think they will love us more if we give them extra food. BUT a dog will love you anyway, you don't need to give them extra food. Their love for their human family is unconditional. So if you think your dog might be carrying a bit of extra weight, go along to your vet and ask for their opinion and possibly a diet plan. SERIOUSLY. 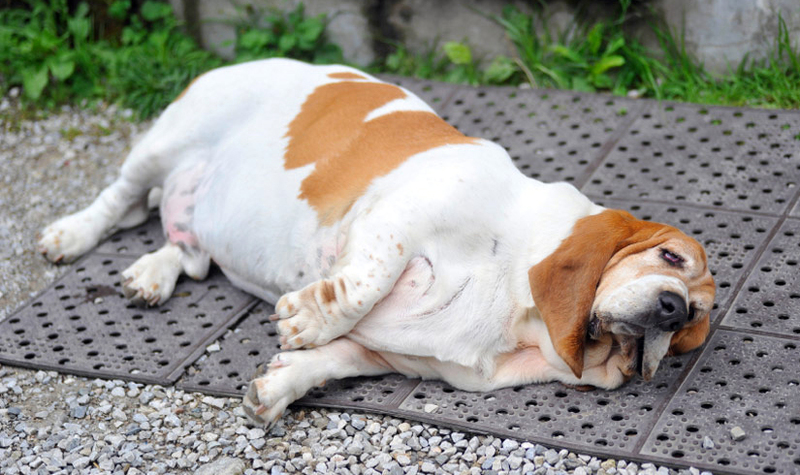 Losing a bit of weight will help your dog's overall health AND help to reduce your dog's snoring. But if your dog snores a lot, and it's getting worse, and your dog is carrying a bit of weight, you should go to your vet for a check-up. 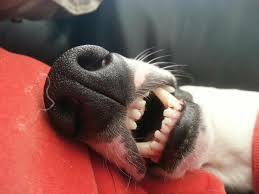 If your dog is snoring, it MAY be serious! We all love our dogs, and we want to do the BEST we can to look after them. So don't ignore your dog snoring. Here's a link to PetMD about dog snoring that you may find useful.